Signature Bank is a very interesting story. Started in 2001 with a significant investment from Bank Hapoalim, Israel's largest bank, it has been on an upward trajectory ever since. Signature has been so successful that it's growth was beginning to put strains on Bank Hapoalim's capital. So in 2004, Signature went public and in 2005 Bank Hapoalim divested its controlling interest. From 2006 through the second quarter of 2011, the bank's assets grew from $5.4 billion to $13.1 billion. It made no acquisitions. 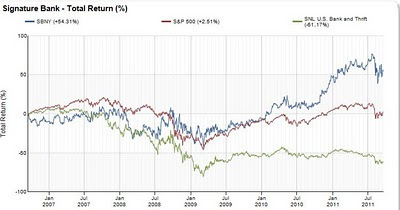 During that period return on average assets went from 0.72% in 2006 to 1.15% year to date. It did not lose money during the financial crisis. 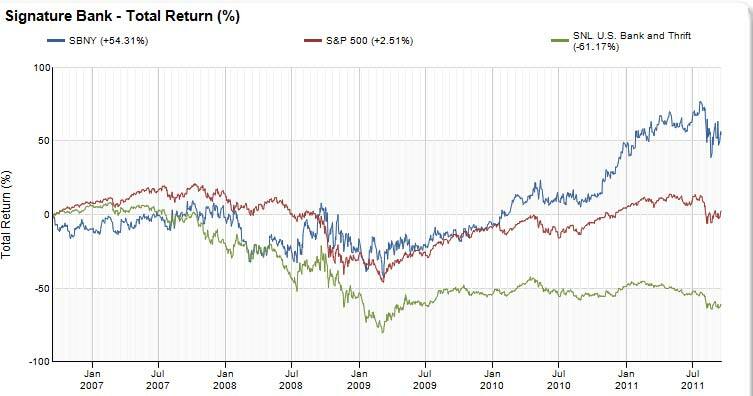 This superior performance led to superior total return to shareholders (see chart). How did Signature do it? As stated, they did not do it through whole bank, branch, or asset acquisitions. Instead, they do it by attracting high performing private banking teams. This strategy started from the very beginning by wooing former Republic National Bank of New York bankers. Republic was acquired by HSBC in 1999. Apparently, HSBC's treatment of key bankers created fertile ground for their recruitment by Signature. "Signature Bank was created to provide talented, passionate, and dedicated financial professionals a supportive environment in which they can conduct their practice to the maximum benefit of their clients. The result is a special feeling clients associate with Signature Bank professionals and, ultimately, the Signature Bank brand: the experience of being financially well cared for." How many vision statements have we read that takes great strains to offend no one, and commit to nothing? In this alone, Signature stands tall. If you roll your eyes at the thought of a vision, don't lose track of Signature because they may roll over you. 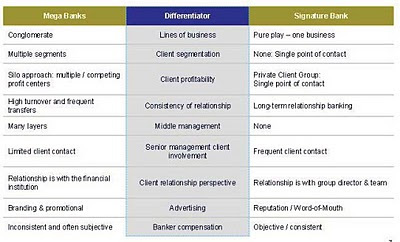 Another key differentiator of Signature's strategy is their single point of contact delivery system. 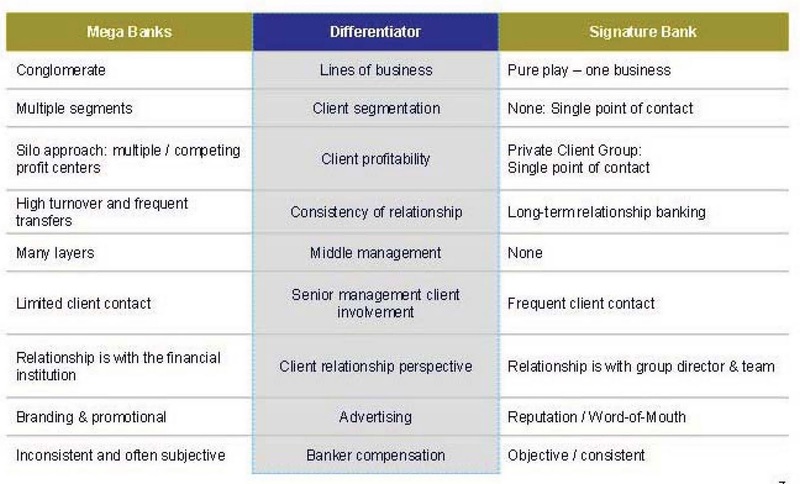 Banks that try to deliver multiple products and services to customers often have different customer touch points. For cash management, call John, for a loan, call Jane, etc. But Signature simplifies for their clients, and lets their relationship manager find the resources necessary to serve client needs. 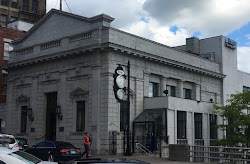 In fact, in an era where it's difficult to tell one bank from another, Signature prides itself in how it is different. See the below slide from their investor presentation. Note: I make no investment recommendations in my blog. Please do not claim to invest in any security based on what you read here. You should make your own decisions in that regard. My bank stock broker chuckles when I phone in trades. Get the picture?